Sen. Mazie Hirono of Hawaii joins other Democratic women senators in denouncing efforts to defund Obamacare. WASHINGTON — Sen. Mazie Hirono (D-Hawaii) voted Friday to stop a government shutdown by passing a clean continuing resolution that also protects health care reform funding. The House of Representatives now must follow suit before midnight Oct. 1 to avoid a government shutdown that would furlough thousands of federal workers in Hawaii alone. “Today, the far-right quest to defund Obamacare failed. Now it is time for House Republicans to act responsibly to stop a government shutdown that would furlough thousands of workers in Hawaii,” Hirono said. “A shutdown would stop Hawaii residents from accessing basic government services, prevent military personnel from receiving their paychecks, stop the processing of new Social Security and veterans benefits and block access to loans and assistance for small businesses. 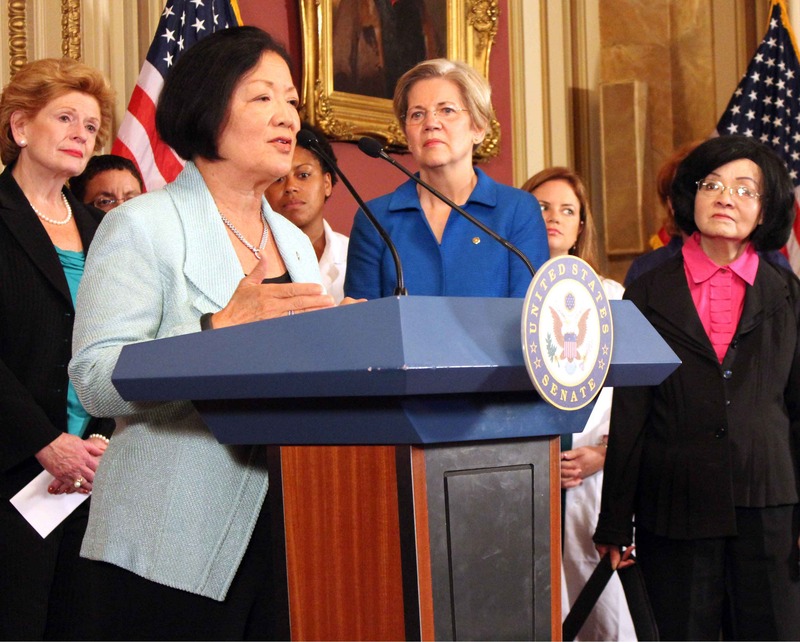 On Sept. 25, Hirono joined her Democratic female colleagues, pregnant women, new mothers and medical professionals to blast Republican attempts to repeal Obamacare. They said that repealing or defunding the Affordable Care Act would take away basic coverage like maternity care, prenatal care, preventive screenings like mammograms, and other services for millions of women, and return women to the days when they could be charged more just for being women, and when pregnancy was considered a preexisting condition, which made it difficult or impossible for pregnant moms to get health coverage. Watch Hirono’s full remarks here: http://bit.ly/170Zfuz. Also speaking were Sens. Debbie Stabenow of Michigan, Barbara Mikulski of Maryland, Patty Murray of Washington, Claire McCaskill of Missouri, Amy Klobuchar of Minnesota, Jeanne Shaheen of New Hampshire, Tammy Baldwin of Wisconsin, Elizabeth Warren of Massachusetts and Heidi Heitkamp of North Dakota. They were joined by new mothers who couldn’t find health insurance under the old system and medical professionals who have seen first-hand how the Affordable Care Act will help women across the country.